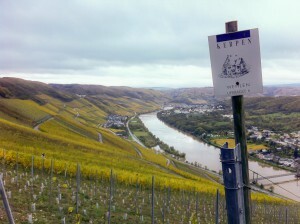 This entry was posted in Germany, Uncategorized, Winemaking and tagged Julian's Year of Winemaking, Mosel, Riesling by Julian Coldrey. Bookmark the permalink. I’m still envious, but now much less after hearing of all the hard work! The balance is the amazing thing – the sting of acidity and also that wonderful intensity and focus. Is just a matter of time before such intensity can be replicated in an off dry Aussie riesling, or does it lie in those crazy slopes? Hi Ed! Yes, the wines are quite fascinating, and I doubt very much we could replicate them in Australia unless there are some undiscovered terroirs that allow the sort of long, slow ripening they get here. The acids seem to stick around such that sugar can accumulate to different levels without the fruit losing its structure. I guess it’s just what happens on these slopes with this weather. Beautiful stuff. Julian. Nice to see a real world account of winemaking in an historic region. There’s been a lot of praise of single terroir, a perfect grape or season, a legendary winemaker or vintage, and it’s all a bunch of hogwash IMHO. Winemaking, and alcohol production in general, has always been brought about by a proud community eager to make use of their beautiful land and what grows on it. It is always a relief to step back from the uptight wine evaluation culture and simply enjoy it for what it is. I’m glad you enjoyed the article. You’re right – it’s refreshing to work in a wine culture that is, in a lot of ways, so grounded. It’s one of the least pretentious regions I’ve visited all year.